At Orion Dental Group our team of professionals works diligently to help maintain and create beautiful, healthier smiles for patients of all ages. Our kind and compassionate dental professionals take a team approach to your oral health needs often involving specialists from both fields of medicine and dentistry to help provide the most comprehensive treatment possible. Drs. Rizvi and Paul understand the strong link between oral health and general health and conscientiously assess your oral health needs during each exam with your overall health in mind. We offer an extensive range of dental procedures and solutions to help improve oral health and ultimately smiles. Our Lloydminster dentists believe that patient education is the key to a healthier mouth. Our team thoroughly explains treatment options allowing patients to make educated, informed decisions regarding their dental treatment and outcomes. With the continual evolution of the dental field, our team works hard to stay abreast of evolving dental trends, materials, and technology. As a commitment to our profession and patients, our team continually engage in training and continuing education courses in order to expand the range of dental services offered through the clinic. Our extensive list of dental services helps provide care for both adults and children at the same clinic! As General Dentists we offer several services including but not limited to implant placement and restorations, orthodontic phase I treatment with appliances and braces, Invisalign, IV, oral and nitrous sedation, minimally invasive TMJ treatment, dentures, wisdom teeth extractions and children's dentistry. We strive to provide a relaxing atmosphere for patients and aim to make each visit as pleasant as possible. We offer dental sedation from our Lloydminster dental office to help patients receive comfortable treatment. For those undergoing extensive procedures or experiencing dental anxiety, sedation can help patients receive the care they need. Our practice provides IV, oral and nitrous sedation that can help create a more pleasant experience for both adults and children. Our doctors will discuss which option is right for you or your child. Our office is also wheelchair accessible; we can even perform dental care for individuals in their wheelchairs when situated in our operatories. Orion Dental Group makes it easier for patients to pay for their dental care with direct billing to insurance companies just ask about our billing policies. For more extensive treatment plans our team will help develop a payment plan that is unique to you. 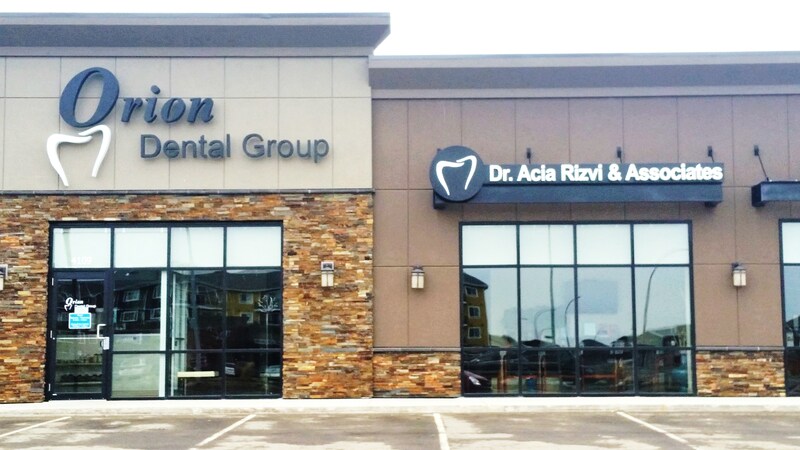 Orion Dental Group in Lloydminster can help individuals and families achieve lasting oral health. Drs. Rizvi and Paul employ their expertise to ensure patients receive excellent dental care. Our practice serves Lloydminster, Vermillion, Wainwright, and surrounding areas, offering a range of treatments for improved oral health. Make our practice your dental clinic of choice by contacting us for an appointment! We welcome referrals and new patients! Our practice offers direct billing for your convenience.